A stunning triple layer cake made up of layers of chocolate, fruit and exotic coconut. This cake covers everything! Ideal for those who are a little indecisive and want to try a range of flavours. 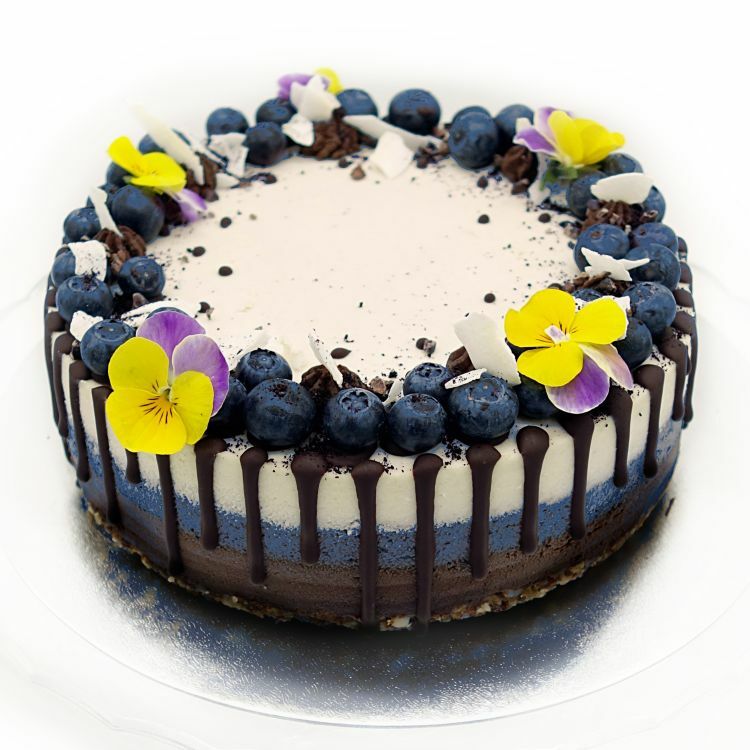 A delicious raw vegan cake that is naturally free from gluten, dairy, eggs, soy, all animal products, soy and refined sugar. Verawnika's unique cakes are made using plant-based superfood ingredients and packed full of amazing taste and interesting nutrition. Keeping the ingredients raw helps retain their nutrients, and so is thought to give greater nutritional benefits. Available in 8 or 10 inches, please choose the size you would like using the option available. Carefully handcrafted to order by vegan pastry chef Veronika. Beautifully decorated by hand, this cake is a real showstopper. Made with the best natural ingredients - no artificial additives. Needs to be kept refrigerated and will keep for 5 days (decoration excluded), or can be frozen for up to 6 weeks. Frozen cake should be left at room temperature for 15 minutes before serving, or can be thawed in a fridge for 30 minutes. Verawnika's deliver all of their products personally to ensure your cake arrives in the best possible condition. They require a 2 hour window for delivery, so for example, if you request delivery at 3pm they will deliver between 3-5pm. You can order in advance, and the minimum notice is 24 hours. Order before 10 am for next day delivery. Please specify what day and time(s) work for you for delivery using the option available. If that time is not available then Verawnika's will be in contact to rearrange the time slot. Then choose your London Zone (Zone 1-2 or Zone 3-4) at checkout. Alternatively you can collect your order from Verawnika's workshop in Aldgate East, London. Please request the day and time you would like to collect using the option available. You can order in advance, and the minimum notice is 24 hours. Order before 10 am for next day collection. Amazing 9 Mini Raw Vegan Cakes! I am celebrating my 1 year as a vegan and this was my present to myself. I have to say it’s the best cake I’ve ever tasted. I was very much surprised I never write reviews so that says something I will order again for sure! Cake was out of this world. AMAZING! There is no other word for the chocolate and lime raw cake we had delivered a few days ago. It tasted like heaven in mouth and looked like a piece of art!!! Thank you for a personal delivery too Veronika, it makes it that bit special when the cook herself delivers the cake.